Hugelkultur Pot Garden at the Good Samaritans Survived the winter and is still producing. This week we will bring a tomato plant and some summer spinach to freshen it up. 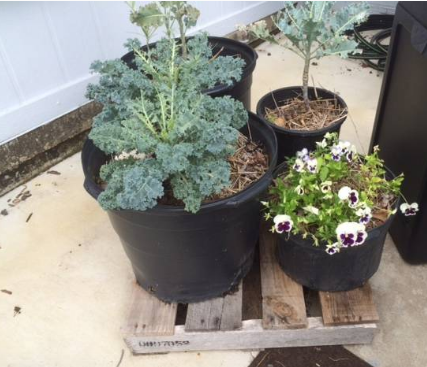 Last fall members of Loving Garland Green made some hugelkultur pots and planted kale and pansies (for a winter flower). Hugelkultur pots are modeled after the larger garden plots: rotten wood and organic matter are placed in the bottom of the pot. Then garden soil is placed on top of that and the plants are installed. This arrangement means that you don't have to water very often, if at all. The rotten wood holds the moisture from the rain and also slowly releases nutrients as the wood continues to rot. When Charlie and I delivered them to the Good Samaritans, the response from the staff and Director Pam Swendig was as gracious as if we had delivered a truckload full of produce. Often, as I've said before, people withhold gifts from embarrassment that the gift might be too small or not good enough. We shouldn't do this. Yet I know that I do from time to time. Even today I found myself thinking: "Eight 8-ounce bags of blackberries and one two-pound bag for the volunteers to munch on, that's not much. Maybe I shouldn't bring them." But then I started thinking in terms of the individual and came to a better conclusion. Thanks to our donation, eight people will each get a half pound of fresh blackberries. Twelve people will get a bag of fresh kale and numerous others will have mint and lemon balm for making tea. No, we are not feeding multitudes, but we are feeding some. I'm thinking that if everyone shared just a little of what they have, no one would go hungry in their community. While we were there I looked at the hugelkultur pots we made and donated last fall. I'm happy to report the kale is still alive, although one pot has gone to seed which is to be expected as Kale tends to bolt in hot weather. 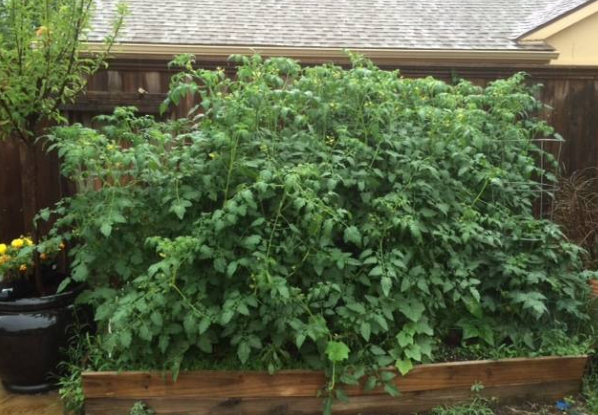 I told Pam that we would bring her a tomato plant later this week for their hugelkultur pot garden. The pansies we brought last fall, also in hugelkultur pots, are like most pansies all over the DFW area--still alive and well. Some folks are getting downright impatient with their longevity this year. Normally, by this time the pansies are dead and gone and have long been replaced my more heat tolerant annuals such as zinnias. The more I walk, work and live in the world of plants, the better able I am to see the value of scientific names. It seems like just about every plant out there has at least two common names. Sometimes folks can be talking about the same plant and not even realize it because they each have a different common name for it. That's one of the benefits of Latin. It's a dead language so nothing's going anywhere and it's common ground regardless the mother language of the gardener or scientist. So if I refer to a Lonicera caerulea, the person I'm communicating with will know exactly the plant I mean whether they are Italian or Chinese (providing, of course, they are familiar with the scientific nomenclature for the plant as there is only one scientific name for a plant). How did I learn about the existence of this plant? Like much of my knowledge: from a friend who is smarter than I am. This morning I got an email from one of them, Susan Metz, who works with the folks here in the Garland Parks and Recreation Department and who has done extensive work over the years with Texas A&M. Susan and her husband have a farm outside of Garland. 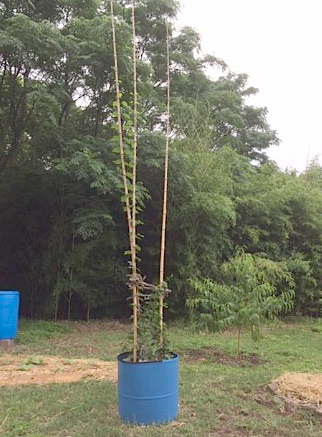 While working at Texas A&M AgriLife Susan was involved in obtaining a SARE grant using pigeon pea as a biological chisel improving soil compaction. It’s a very beautiful legume beneficial to bees as well . Susan obtained the seed from Dr. Phatak who worked with the crop at U of Georgia and about a month ago she donated five healthy plants to the Garland Community Garden. I planted them in our multicultural plot as these legumes are a dependable food source in developing countries all over the world--particularly in desert areas where little water is available. Susan wrote to me this morning that for her next adventure she is going to try growing a Lonicera caerulea Honeyberry "Borealis" Antioxidant-rich berries. 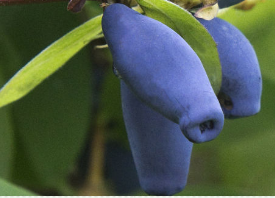 The Haskap plant produces a delicious fruit that can be hard to describe. Many people describe it as a mix between raspberry and blueberry, but in our opinion it is completely unique. The haskap berry is quickly becoming recognized as the latest super food. Its antioxidant and other health benefits are well known in places like Japan, where the berry is considered a delicacy, and scientific study is confirming the benefits of haskap. A 2008 article in the Journal of agricultural and food chemistry, for example, highlights the role haskaps can play in preventing chronic conditions like cancer and diabetes. Because they produce fruit early in the growing season and because of their exceptional winter hardiness, Haskaps make an excellent choice for orchard owners and small scale growers alike. Haskaps can survive winter temperatures as low as -45°C and their flowers can be exposed to -7°C temperatures with no damage to the fruit. I definitely plan to obtain some plants for my own woodland garden in my front yard as well as some for the Garland Community Garden. I have tried to grow blueberries with little reward here in Garland. I guess it can be done if one is willing to continuously be adjusting the pH of the soil as blueberries prefer much more acid on their soil menu. Just a few miles east of here they grow well, but not here in our clay-ridden Blackland Prairie soil--which in my opinion needs to be amended with expanded shale regardless what you are planting. There are many varieties to choose from as you can see from the link provided above. I think I'll choose the Borealis, the Honey Bee and the Aurora varieties. Next year I'll add the Boreal Blizzard to the mix. I will order and plant this fall. I just planted a Jujube (pronounced juh-ju-bee) in the Garland Community Garden this Memorial Day weekend in memory of all those who have gone before us. 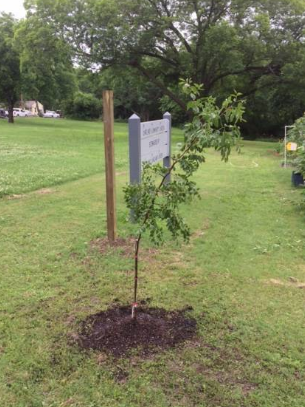 With a little bit of luck, this tree will outlive all the visitors including children who visit the Garland Community Garden for at least the next 30 years. Yes, the garden is being built to endure. Why do you think we are planting so many perennials and self-seeding drought tolerant plants? When/if we are gloating in the luxuriant, but false glow of our longevity as a species, we might bring ourselves down to earth by considering the world of plants. It’s true that our expected lifespan triumphs over that of many animals such as dogs, cats, chickens, rats and the like. However, in the world of plants, many examples of superiority can be pointed out. Take the giant redwoods in California, for example. These giants can live to be 2,000 years old and have graced the planet for more than 240 million years. The jujube is another such example. There are jujubes in China that are said to be over 1000 years old. The jujube which is said to have originated in northern Africa, has a long historic background in China as well as India. It is mentioned in the earliest Sanskrit literature, and is intimately connected with the folklore of people of Punjab who consider jujube plants most sacred. The fruit of the tree is associated with health and rejuvenation. The jujube (also called “Chinese Date’) is a tough tree that needs little water and grows in just about any type of soil—from our thick clay to sandy soil. Believe me, it grows in Dalhart, Texas and that proves my point. You know what I mean if you’ve ever visited the panhandle of Texas. (I grew up near there—keeping in mind that out in that part of Texas anything within 100 miles east, west, north or south is considered “near.”) A jujube tree in Dalhart continued to produce fruit throughout the Dustbowl Days. Frank N. Meyer, a plant explorer employed by the USDA, went to China in 1908 to catalog plants and trees that we did not have in this country. One group of trees was the improved varieties of jujubes. Although the wild, very small fruited, jujube had been imported to the United States from Europe in the 1800s, it was not very good and of little value. These improved varieties were much better, and the USDA thought they had a chance to become a great fruit for the Southwestern United States. Since they can grow with as little as 8 inches of rainfall a year, the thought was that they were ideal for many of the drier states, including Texas. As mentioned, the Jujube thrives in our climate, requires little care and lives a long time. This deciduous tree typically grows 12 to 15 feet tall. However, if you want to see the largest known jujube tree in Texas, if not the USA, visit the Fort Worth Botanical Gardens. They have a Jujube tree that reaches 45 feet to the sky. I find it interesting that the Jujube appears to grow mostly on one side. 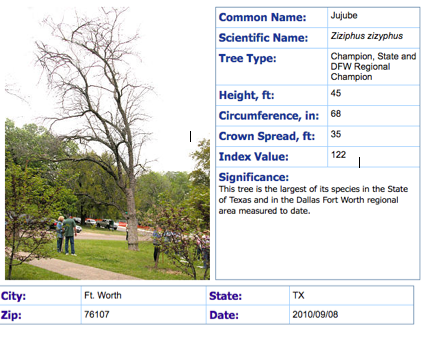 If you look at the Ft. Worth tree and then look at the jujube I planted today, you'll see what I mean. Notes from November 12, 2015: Pile of Jujubes at Judy Li’s place. We can grow jujube trees in our area and I hope to plant some this spring at the Garland Community Garden. I ate several fresh ones while at Judy’s and she also served Charlie and me some delicious hot Jujube tea. Jujubes are sometimes called red dates or Chinese dates. They are great! 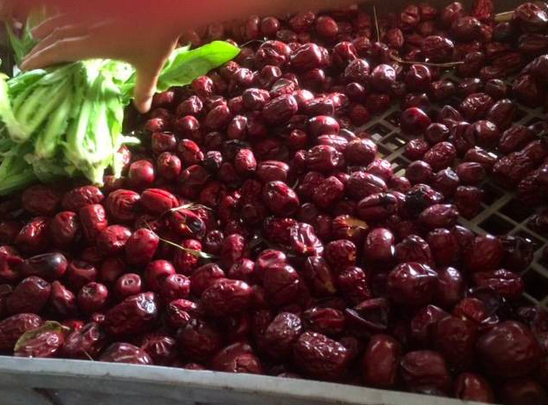 It was November 2015 [The Epic Saga of Judy Li] when I tasted my first jujube. As far as I’m concerned, to know a Jujube fruit is to love it. I can see why it is so popular with the Chinese. The fruit tastes wonderful—sweet, smoky, chewy, juicy. Their taste and texture are similar to that of a date but while sweet, the jujube is not overpoweringly sugary as dates can be. Tea made from the fruit is delicious to drink. After drinking a cup of it, I had a wonderful sense of well-being that I still recall seven months later. I do believe its claims to reduce anxiety. The jujube produces small, somewhat fragrant white to greenish yellow flowers of 1/5-inch diameter in large numbers in the leaf axils. The flowering period extends over several months from late spring into summer. However, individual flowers are receptive to pollen for only one day or less. Pollination needs of the jujube are not clearly defined, but appear to be done by ants or other insects and possibly by the wind. When our Jujube blooms I’ll be sure to watch to see what pollinators visit the tree. Most jujube cultivars produce fruit without cross-pollination. The jujube is well protected from late spring frosts by delayed budding until all chance of cold weather has passed—making it a perfect fruit tree for our area with its sometime late February/early March ice storms. The fruit is a drupe, varying from round to elongate and from cherry-size to plum-size depending on cultivar. It has a thin, edible skin surrounding whitish flesh of sweet, agreeable flavor. The single hard stone contains two seeds. The immature fruit is green in color, but as it ripens it goes through a yellow-green stage with mahogany-colored spots appearing on the skin as the fruit ripens further. The fully mature fruit is entirely red. Shortly after becoming fully red, the fruit begins to soften and wrinkle. The fruit can be eaten after it becomes wrinkled (the only kind I’ve eaten and they taste wonderful—like dates but without the overly sugary taste of dates). Many people prefer them during the interval between the yellow-green stage and the full red stage. At this stage the flesh is crisp and sweet, reminiscent of an apple. The crop ripens non-simultaneously in July and August and fruit can be picked for several weeks from a single tree. If picked green, jujubes will not ripen. Ripe fruits may be stored at room temperature for about a week. The fruit may be eaten fresh, dried or candied. Fresh fruit is much prized by certain cultures and is easily sold in Chinese, Korean, Vietnamese, and Indian markets. Tree dried fruit stores indefinitely and may have good marketing potential as it dries on the tree without the use of a sulfur preservative. Most Chinese cultivars in the U.S. are grafted or budded onto a thorny rootstalk, which produces many suckers from the roots. There is evidence that jujube cultivars will root on hard or soft woodcuttings. However, successes have been limited to date with this process of plant reproduction. Jujubes also can be propagated from seed, although they do not come true. Most jujube cultivars produce fruit without cross-pollination, but seeds from such self-pollination are usually not viable (such as from the Li or Lang cultivars). Our jujube in the Garland Community Garden is a Li cultivar. “Root sprouting is a problem under mature plantings and can lead to the formation of a thicket if control measures are not undertaken. As soon as sprouts form, they should be cut off at or under the ground. Because of our frequent mowing at the garden, root sprouting is not anticipated to create any problems. In accordance with the National Center for Biotechnology, juice through the jujube fruit is shown to have cytotoxic action on various tumor lines. A report demonstrated that the amount of viable cells have been reduced after treatment method. These types of advantages have been related to the jujube’s high content of bioactive compounds. Studies carried out over more than a 20-year period have demonstrated bioactive compounds to play a crucial role within the protection against long-term illnesses. Jujube fruit is additionally an anti-oxidant along with re-energizing qualities. The dried fruits of the jujube consist of saponin, alkaloids and also triterpenoids. These 3 substances are all valuable in cleaning the blood, and also as a guide to digestion of food. In Japan, research has revealed the jujube can improve immunity. Additionally, jujube fruit is used to enhance muscle strength, improve strength, and as a tonic to boost liver function. A very common usage is to make a tea from the fruit to deal with aching throats. Ingesting the fruit may help deal with long-term exhaustion, respiratory disease, and also anemia. The Journal of Ethno-pharmacology documented in April 2009 that jujubes have an optimistic impact on the liver. They discovered that the jujube provides safety from liver injury through serving as an anti-oxidant. A low-calorie treat: Every 2-ounce offering of raw jujube, about 4 fruits, just has 44 calories and virtually no fat yet provides you with 1/2 gram of protein. So why don’t we hear more about jujubes? Well, you just did. Now get out there and tell others about this great plant that easily grows in North Texas and throughout most of the southern and southwestern USA. GARDENS: Just another reason to live in Garland, Texas! Gardens offer communities infinite opportunities: job creation, healthier living, a chance to get to know your neighbors better, good food, happy memories, a learning format for you and your children and much more. Jaycie, my neighbor and blackberry picker partner. Jaycie loves blackberries so she picks on the half for me. It's Blackberry Time in Garland, Texas! May has been a busy month for me. I've been so busy with extra curricular activities in my life that my own yard fell into sore neglect. Two days ago, with the assistance of two of my great neighbors, I got it whipped back into shape. While working in the front yard, I happened to notice blackberries on my front two bushes were ready for picking. 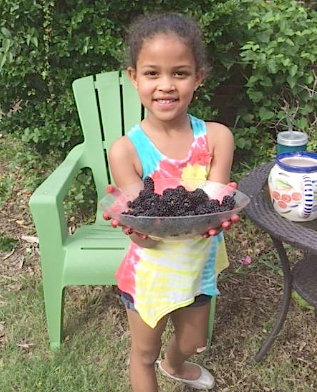 Jaycie and I picked and weighed four pounds of blackberries on Wednesday, May 25--the first of the season from my garden. I like to weigh and record each picking and then brag about the total poundage at the end of the season which usually comes the end of June/first week of July. Gardens are filled with opportunities to teach our children. For example, Jaycie had the opportunity to weigh the blackberries on a food scale and then divide them into three equal portions: one for Jaycie and her mother; one for Margie and Gene; an one for me and Charlie. Last night Margie, Jaycie's grandmother who lives across the street, invited me over in the evening for some blackberry cobbler in her backyard. The cobbler was made from berries that came from my garden. By the way, speaking of gardens, Margie's looks great. The most remarkable plant in her back yard is an olive tree. The tree is in a pot and is just under three feet tall--but it is filled with olives. There are easily 100 olives on that small tree. Oh yes, the cobbler was wonderful. Get to know your neighbors! That's the best advice I can give. Then you might get some free blackberry cobbler in May or June. SPEAKING OF NEIGHBOR'S GARDENS . . . The plants on the left he started from seeds, given to him by one of Loving Garland Green members, Nancy Seaberg back in March. In Garland, neighbors share. The plants on the right were purchased at Garland's great locally-owned nursery, Rohdes. They were tiny plants in 2 1/2 inch pots that Charlie purchased for 79 cents a plant. Your best and cheapest tomato plants will come from a local nursery--not from a big box store that carries Bonnie Plants for $3.78 a plant. Don't be lazy, seek out a local nursery and you'll see what I mean. Not only will you get better quality plants, they will be cheaper. 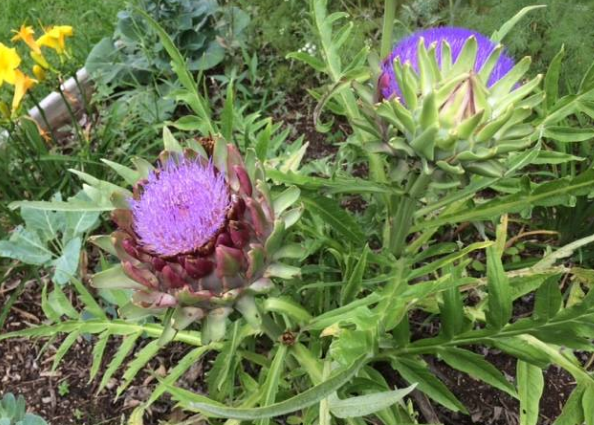 My blackberries ripen and my artichoke goes to flower before I have the time to harvest it. 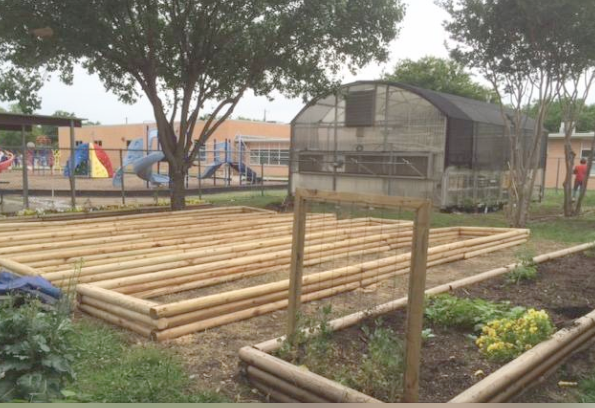 THE MAGICAL GARLAND COMMUNITY GARDEN IS MORE BEAUTIFUL THAN EVER! Like our local community, the Garland Community Garden is a patchwork of diversity--we planned it that way. There is beauty in the symmetrical layout of gardens with their raised beds, encased in wooden borders equidistant, one from the other. We can appreciate the precision and orderliness of it all. However, homogeneity can quickly become a tiresome affair. Besides, homogeneity is a standard that few can consistently apply to their lives. To expect it is to invite disappointment. If it's diversity you seek, you won't be disappointed when you visit the Garland Community Garden. We intentionally have plants growing in all kinds of beds--from square foot gardens to hugelkulturs; and in all kinds of containers--from 55 gallon food-grade barrels to IBC totes. Like life, our garden does not contain many right angles. One of the reasons I was so excited to assist in building a hugelkultur for the Watson schoolyard garden this week was the opportunity the hugelkultur offers to demonstrate to the students that looks can sometimes be deceiving. 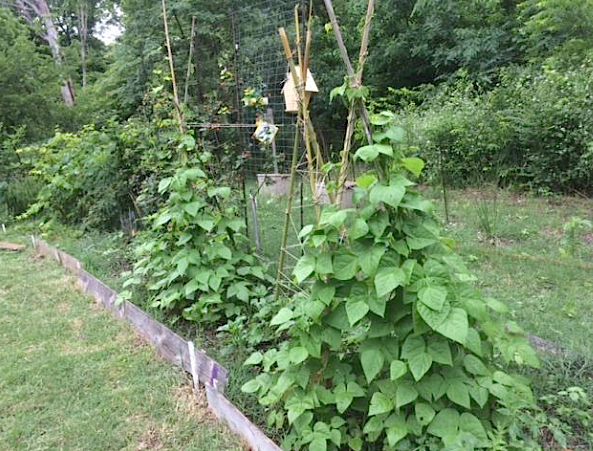 At first appearance, the hugelkultur appears messy--especially when compared to their lovely raised beds that are encased in wood and are all neatly lined up. However the hugelkultur is eco-friendly while the other beds are not. The hugelkultur follows closely with permaculture ethics by setting up a micro-eco system that is self-sustaining. After a year, the plants in the hugelkultur, except in cases of extreme drought, will never need watering. On the other hand, the plants in the raised bed will need watering at least once a week. 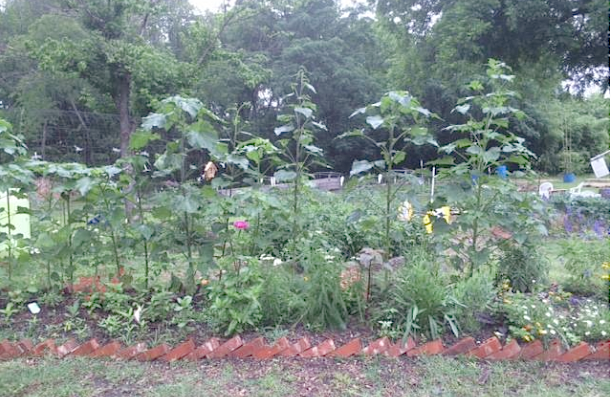 "Pollinator Heaven" - A new garden plot added this spring. It is filled with native plants--all beloved by pollinators. Among the native plants, we have about 25 native milkweeds growing in this plot. Sunflowers form its back border. We are proud of this sign in our Butterfly Garden (which also was a new addition this spring). 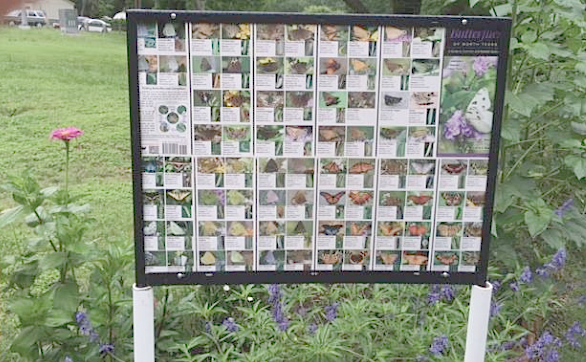 This sign shows the names and photos of all the common butterflies in the North Texas area. Thus, if you are visiting the garden and see a butterfly that you don't recognize, take a photo of it with your phone and then see if you can locate it on our sign. Please be sure to contact us on our site Lovinggarlandgreen.org and share with us. 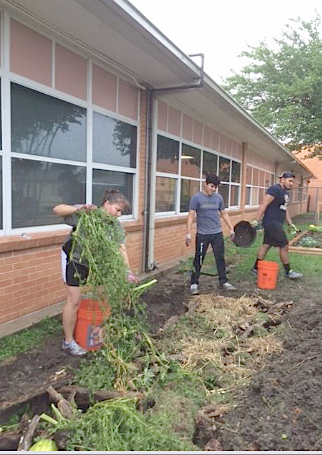 We are the official stewards of the Garland Community Garden. In addition to the green beans, we have all kinds of fruits, vegetables and herbs growing in the garden: watermelon, cantaloupe, sweet asian melons, pigeon peas, tomatoes, peanuts, Romanian cucumbers, blackberries, loofah, tarragon, rosemary, mint of many varieties, Malabar spinach, basil of many varieties, sweet potatoes, eggplant, horehound, hops, oregano of many varieties, chamomile, borage, comfrey, kale, and more. Our garden is open to visitors 24/7 from sunup to sundown. Unlike many community gardens we are located right beside a main thoroughfare and we have no fences. We are located at 4022 Naaman School Road in Garland Texas 75040. The land is owned by the city and the garden area is stewarded by Loving Garland Green. Two students, second grade teacher Jennifer Clements, a parent, and Charlie and I dug a pit approximately four feet wide, twenty feet long and a foot deep. If you want to know how long that takes, it's about 2 hours--with six people digging. 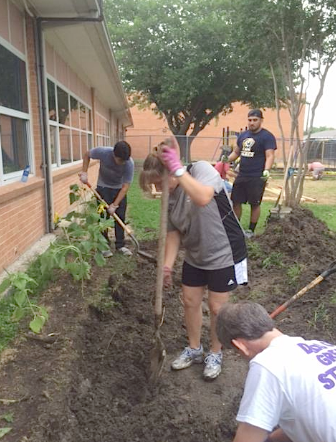 It's tough to dig through the clay of our Blackland Prairie soil. 2. Then came the rotten wood: about 10 minutes of easy work. (Rotten wood is not heavy.) Rotten wood is the bottom layer of the hugelkultur. 3. Next we piled organic matter on top of the rotten wood. In addition to that we scattered two 40 pound bags of chicken manure over this mixture. Spreading the organic matter (shrub cuttings, grass clippings, compost, watermelon rinds, banana peels, etc.) took less than 10 minutes. 4. 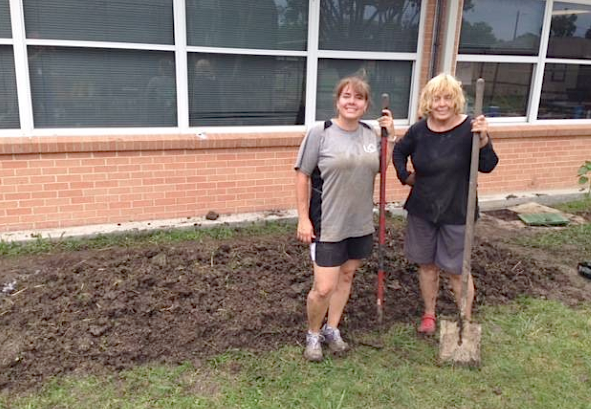 Here are Jennifer and I, standing in front of our almost finished hugelkultur (I'm the one whose eyes are closed on the right. Apparently, I didn't realize how tired I was.). The part of the process you don't see is what it took to put the soil back on top of the rotten wood and organic matter. That process was almost as difficult as digging the pit. (Jennifer thought more so.) Initially when digging the soil out of the bed, we placed it on top of a tarp we had spread along the edge of the bed. Once the wood and organic matter were placed in the bed, we shoveled and raked the soil back on top of the logs. After moving about five inches of soil into the bed, we then spread a forty pound bag of expanded shale over the top of the soil and mixed it in. Next we shoveled another five inches soil onto the mound, spread another bag of expanded shale and mixed that in. All total we added five 40-pound bags of expanded shale to the North Texas Blackland Prairie soil. Our north Texas soil is great in terms of its nutrient value, however its clay texture leaves much to be desired as it often smothers plants to death as they are not able to derive nutrients due to the density of the soil. Moving the soil back into the bed took about 2 hours, but it seemed a lot longer because we were tired. 5. Here is our finished hugelkultur. As the final step we spread two bales of straw over the mound. This mulch will protect the organisms in the soil from the heat of summer. I pushed aside some of the straw today and planted a Turks Cap that I had grown from a cutting. It's that little green spot you can see on the straw pile. This plant is just an experiment to see how/if it will survive the summer. 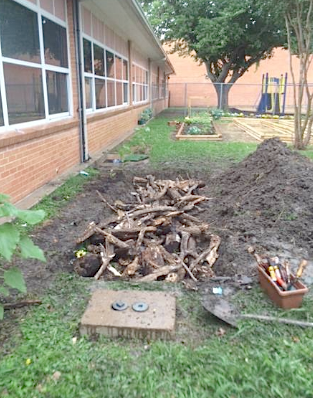 The hugelkultur will not be planted by the second grade students until fall. 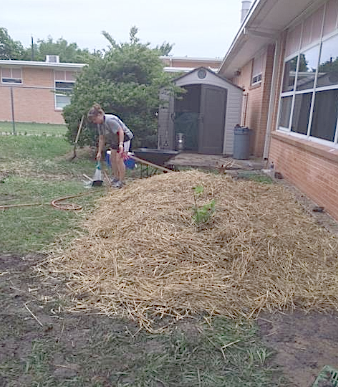 Over the summer the straw will decompose and in the fall a layer of compost and garden soil will be spread over it. At that point plants will be installed and seeds planted. This garden is intended to be used for vegetables as well as a few plants for pollinators. Four new raised beds were built today while we were building the hugelkultur. For the next few months the two unplanted beds in the foreground will be used for a scientific study on milkweeds that is being conducted by a graduate student from Midwestern University. The other two beds will be used by students at Watson Tech. (Note: there are already several existing beds and a greenhouse in this great schoolyard garden area.) One of the fun things that happens at Watson is that at the end of the growing season a meal is prepared for the gardener students and they have the opportunity to reap the rewards of their harvest and eat what they have grown.